to ensure your water is safe! The type of water filtration you use depends on the type of sediment, minerals, chemicals, contaminants, and bacteria in your water supply. Every location is different and NO LOCATION IS IMMUNE! It doesn't matter if you are on a municipal water system, natural spring, or underground well; none of these sources guarantee that your water is pure, safe, or healthy. Basically, if the water came out of the ground, then it should be filtered before you drink it! CLICK HERE to find out more about what could be in your drinking water. There are two basic types of water filter. Those that are installed inside a water ionizer and those that are installed outside a water ionizer or as a standalone filter. External filter systems can be configured in any number of stages with each stage removing a particular type or group of contaminants. Removing one type or group of contaminants is often considered a 1-Stage filter (i.e. removing either chlorine, fluoride-lead-arsenic, or nitrates). Filters can be combined to form any number of stages to form: 2-Stage, 3-Stage, and even 7-Stage (i.e. reverse osmosis) filter systems. 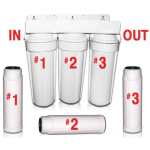 How many stages you need to filter your water depends on the possible contaminants in your water. Emco Tech's revolutionary BioStone Filtration System employs 9-stages of filtering media to clean the water and prepare it for ionization, making it the finest and most effective filtration available in any ionizer. The BioStone employs Silver impregnated GAC, calcium, tourmaline (in the form of BioCeramic beads that slightly alter the electrical properties, even before ionization) and a fiber mesh system. These nine stages add up to an unmatched delivery system for the clean and healthy water. The Spartan Ionizer Shield is for those who demand a higher level of protection in both the quality of their water and in protection of their ionizer. This filter system includes an specially designed 2-Stage external filter w/housing and an upgrade filter to go inside the ionizer. Click here to read more. 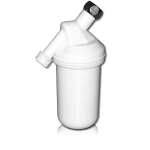 Sediment Filter - This filter is used in the Athena only, in Filter position #1. 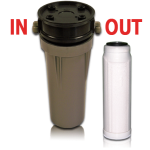 Ultra BioStone Filter - The finest water filter available for water ionizers and used in 3 of our water ionizers. Replaces filter in position #2 in the Athena only. Recommended for untreated (non-chlorinated) water sources. ReMin Max Filter - To make it possible to energize "pure" water (such as water produced by a Reverse Osmosis system), minerals must be added back into the water. Our Remin Max contains a proprietary, healthy blend of inorganic and organic forms of calcium, magnesium bi-carbonates and 70+ organic trace elements. The AlkaPod is a portable water dispenser that converts regular water into alkaline and ionized water that you can drink anywhere, anytime. The AlkaPod allows you to convert your water while traveling, on vacation, or even at dinner! The AlkaPod uses 13 types of minerals in its filter including Tourmaline, Zeolite and Maifanshi stone. Scale Guard Inserts - Intended for use inside your (Melody, Delphi, and Athena) ionizer's mineral port, the Scale Guard Inserts address the issue of scale buildup caused by excessive calcium and magnesium. Vitashower SF-1 Vitamin C Shower Filter - Uses Vitamin C as the agent to effectively remove the harmful chlorine and chloramines. It contains 350mg of vitamin C and can filter 15,000 gallons of water! With a cost of ONLY $39.95 for the Vitashower SF-1 and ONLY $27.95 for replacement cartridges>, Vitashower is the most affordable shower filter you can buy. The most effective way to economically reduce chloramines is through the use of specially designed c.. Double Filter Housing Arsenic-Lead-Heavy Metals Capacity: Up to 1,500 gallons Intended for use .. External Sulphur/Iron Reduction Cartridge w/HousingIntended for use outside of your water ionizer ma..
Nitrates In most cases of excess nitrate concentrations in water supplies, the primary source is sur.. 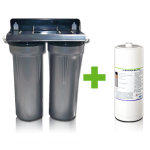 External Arsenic/Lead Reduction Cartridge w/Housing Capacity: 4,500 mg (1,000 gal est. )Intended for.. External Nitrates Reduction Cartridge w/HousingCapacity: Up to 1,500 gallons Intended for use outsid..
Spartan Filtration System (Hard Water) The Spartan Ionizer Shield water treatment and filtration ..
Spartan Filtration System (Soft Water) The Spartan Ionizer Shield water treatment and filtrati.. External Heavy Metal Reduction Cartridge w/Housing Capacity: Up to 1,500 gallons Intended for use .. External Remineralizer Cartridge w/Housing Capacity: Up to 1,000 gallons Designed for use outside .. External Chlorine/Chloramines Reduction Cartridge w/Housing Up to 1,500 gallons Intended for use ou.. 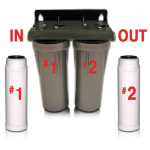 External Arsenic/Lead Reduction Cartridge w/Housing Capacity: 4,500 mg (1,000 gal est. )Intended fo..